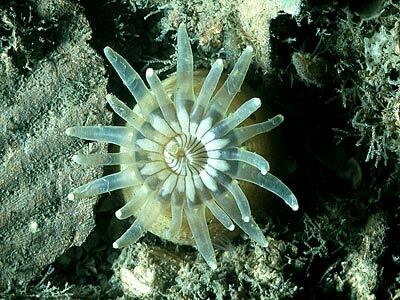 Description: This burrowing sea anemone has a fairly elongate column with a rounded base, sometimes encrusted with sand. There are 20 stout, cylindrical tentacles, each with a constriction near the tip, forming a terminal knob. The disc has dark radial lines on cream or orange background, the tentacles are translucent, cream or orange, more or less speckled with cream or brown. Other variations probably occur. Size is up to 60mm across tentacles, column up to 120mm in length. 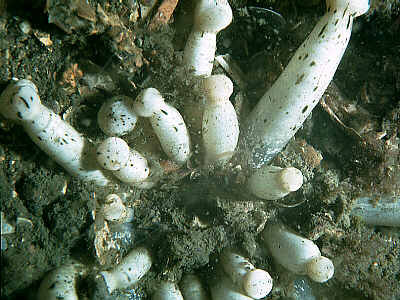 Habitat: Burrows in sand or mud, always offshore from 5-1000m depth. Distribution: Occasional in English Channel, Irish Sea, and off southwest Ireland. Also from Scandinavia, Bay of Biscay, and the Mediterranean. There are only a few recent records, please notify any new records. Similar Species: Unlikely to be confused with other species. However there is a possibility that the specimen collected in Strangford Lough and the ones from Scandinavia are a different species to the ones from Plymouth southwards. 20 knobbed tentacles, very distinctive. Rounded base, more or less elongate column. Picton, B.E. & Morrow, C.C. (2016). Anemonactis mazeli (Jourdan, 1880). [In] Encyclopedia of Marine Life of Britain and Ireland.